WinZip is a popular file compression utility with over 20 years experience as the leader in the file compression industry. WinZip allows you to open, create, share and encrypt zip files. 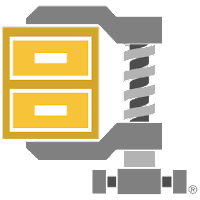 Furthermore, WinZip delivers faster file compression technology, a streamlined design, significant new file sharing functionality, and extended enterprise support. WinZip is trusted by millions of businesses and consumers to boost productivity, simplify file sharing, and keep information private. It's part of the Corel family of companies. WinZip is available in three editions: Standard, Pro and Enterprise (Compare Editions). The Enterprise special version includes support for SharePoint and Amazon S3. This allows your business to offer employees easy, secure sharing across email, SharePoint, Amazon S3, Office 365 for Business, and IT-enabled clouds, social media sites and instant messaging services, all from one application. WinZip 21 also ensures your business meets U.S. government requirements for FIPS 140-2 encryption, both at rest and during exchange on a properly configured computer. WinZip can also be set to FIPS 140-2 compliance, even if Windows OS is not in FIPS 140-2 mode. Supported file formats: Zip (.zip), Zipx (.zipx), RAR (.rar), 7Z (.7z), BZ2 (.bz, .bz2, .tbz, .tbz2), LHA/LZH (.lha, .lzh), Cabinet (.cab), Disc Image (.img, .iso), TAR (.tar), GZIP (.gz, .taz, .tgz), Compress (.tz, .z), UUencode (.uu, .uue), XXencode (.xxe), MIME (.b64, .mim), BinHex (.bhx, .hqx) and most other compressed files. New workflow enhancements and an updated interface that make it faster and easier to share files across email, your cloud accounts, and ZipShare. Disclaimer: Direct downloads for the lastest version of WinZip 21.5.12480 are provided by the official software's author, we can't guarantee safety, availability or download speed. Moreover, we don't and we won't provide any pirated/illegal versions or tools. We recommend you to avoid it as these methods can harm your device. If you like the software, buy it to support the developers. (We provide software discounts for many worldwide brands).